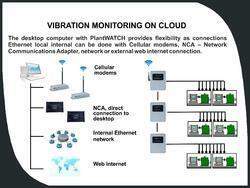 Providing you the best range of wireless machine condition monitoring service, universal vibration monitor and wireless vibration monitoring on cloud (plantwatch software) with effective & timely delivery. We provide Wireless Machine Condition Monitoring Service or Remote Vibration Condition Monitoring Using Cloud Technology. A software package facilitating the remote interaction with an expert or by the user. Monitoring of vibration velocity (severity) of rotating machinery to ISO 10816-1 and reciprocating engines to ISO 10816-6. The PlantWATCH software combined with the iTi Technologies wireless data acquisition hardware VMU provides a platform to trend, analyse and alarm early machine faults helping to prevent unscheduled downtime. Trend – Temperature, low mechanical vibration, medium and high vibration and lastly high frequency demodulation. Time waveform – For in-depth analysis PlantWATCH provides full FFT spectrum and time waveform analysis. PlantWATCH software provides FFT Spectrum and time waveform trending, analysis and advanced alarm capability. VMU8, Wireless 8 Channel data acquisition device for vibration, temperature and voltage monitoring, all within a wall mountable or portable 10” x 8” waterproof NEMA 4X (CSA Class 1 2DIV) industrial enclosure. Wireless distance range 300’ to 2,000’ indoors and up to 2+ miles outdoors. Expensive network cables not required. Waterproof and rugged industrial NEMA 4x enclosures. Each component within the system can be replaced individually if damaged. 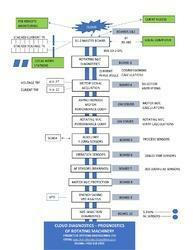 Each step within the system includes wireless capability. 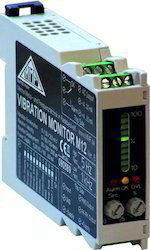 Looking for Vibration Monitoring System ?